Here today, gone tomorrow! That’s how it goes with Rihanna’s dreadlocks. Photographers caught a happy and smiling Riri arriving at JFK airport today and we must talk about those Timberlands. 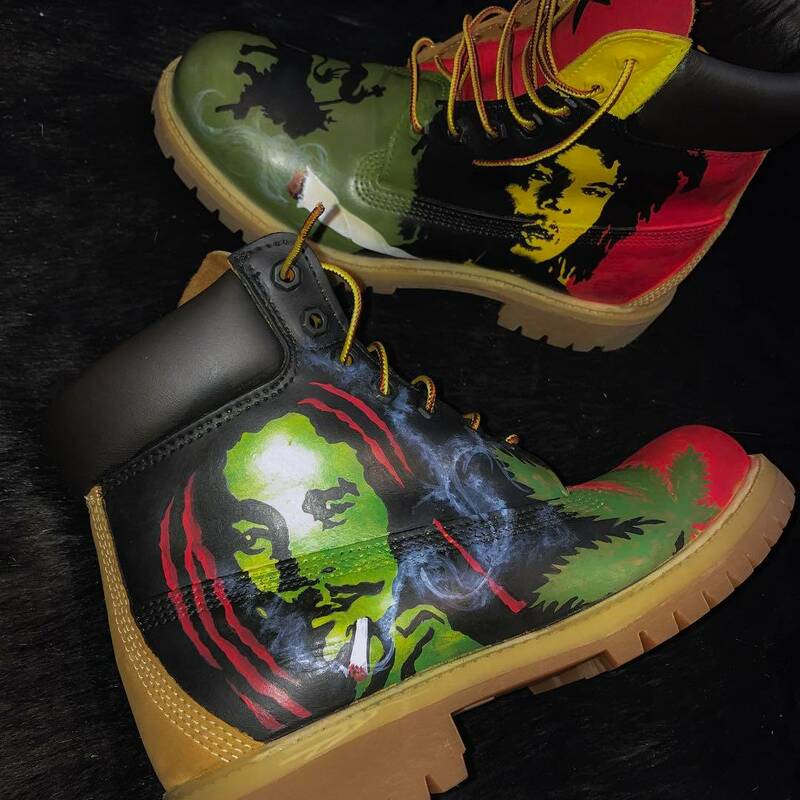 Rih rocked a killer pair of Timberland boots featuring art of Bob Marley, the Lion of Judah, her beloved Rhenna character, and Puma’s signature cat logo. Basically, it’s a mashup of everything Rihanna loves. Artist Donnell McFadden Brooks is the man behind the art and he posted the photo above. Check out his Instagram page for more of his original artwork. Click here if you want a pair of the original Timberland boots. She also wore the Fenty x Puma lacing fleece jumpsuit ($220) from the Fall 2016 collection. The loose-fitting one-piece boasts an oversize fit, lacing detail and pockets. This Vetements jacket is a staple in her closet. Completely lined in shearling, the sold-out leather jacket features elongated sleeves and a stand-up collar. FRWD has a similar piece for $3,829. Rih’s sunglasses are vintage Ray-Ban. This Caballero style was hugely popular back in the 80s. She also carried a green Saffiano briefcase by Prada. Pictured above in black, it has a zip closure, top handles and detachable shoulder strap. The black is available here for $2,490. Note that her bodyguard carried her other Prada tote, which bears artwork by Christophe Chemin.